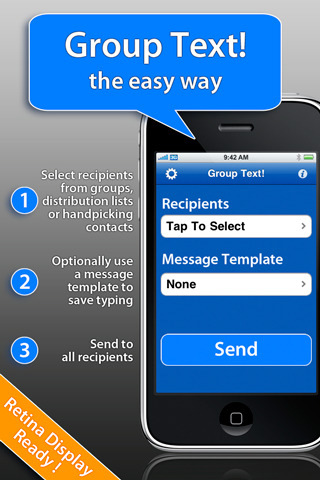 Redbits is offering to the iPhone users their just released app called Group Text 1.0! The easy way app for iPhone devices is available since today. With Group Text! you’re able to send SMS to address book groups, to handpicked set of contacts as well as to custom distribution lists that don’t affect your groups. If you use the same text frequently, app gives you ability to create templates to send prompt SMS and save your precious time. Group Text! 1.0 is only $0.99 USD and available worldwide exclusively through the App Store in the Productivity category.